All sports fans love the Titan! Not just a casual accessory with your school logo on it, the Titan is an "in your face" statement of allegiance to your alma mater that commands attention. 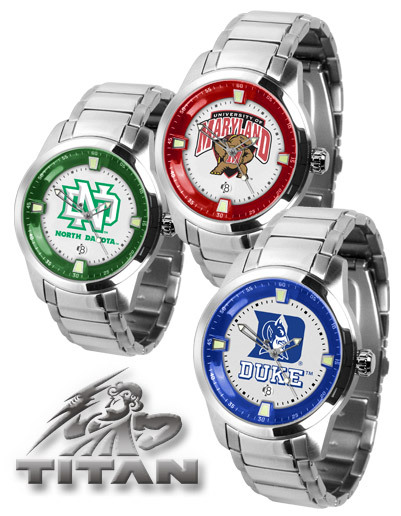 For the Titan, Suntime has constructed a new 44mm, solid stainless steel case that houses a billboard-sized presentation of your favorite school logo. The officially licensed image is precisely recreated using our PMS Spot Color pad printing process, then magnified by the Titan's scratch resistant, convex mineral crystal. Beneath the Titan's dial resides the quartz accurate Japanese Miyota movement with date function. The quality isn't confined to just the 5 ATM water resistant watch case. To keep the Titan secure to your wrist, Suntime added a superior quality watch band accented with a contrasting polished and brushed finish on each solid stainless steel link. The Titan's band exhibits an aesthetically clean transition from the monumental case to the elegant closure of the dual-button, inner deployment clasp. FANFARE TRIVIA: What former Nebraska football coach was born on this day in 1956? The Sport Steel is one of our bestselling timepieces and is available with a Gameday or AnoChrome dial! Our handsome, eye-catching Sports Steel watch comes with a stainless steel link bracelet. A date calendar function plus a rotating bezel/timer circles the scratch-resistant crystal. Sport the bold, colorful, high quality logo with pride. Have questions about how to get the Sport Steel timepiece in your store? Talk to our sales representatives to find out more. Call 1-800-659-2824 today. Another Fan Favorite! Elegant design for the modern man or woman who wants to show their team spirit! The dial is presented in a sleek, stainless steel case and bracelet that rests fashionably yet comfortably across the wrist. Features a convenient date display, quartz accurate movement and a scratch resistant mineral crystal face. Place your order today by calling 1-800-659-2824. The Eclipse Ladies’ watch combines the versatility of a jewelry-inspired bracelet and the functionality of a timepiece. The fashionable Eclipse creates a graceful profile with the elegant faux chain bracelet in a gleaming Stainless Steel finish. Call 1-800-659-2824 and ask our sales representatives how to get these products in your store today.